Relying on our expertise and know-how in this field, we are well-known as one of the prestigious organization in offering a wide range of Nonstick Cooking Pot. 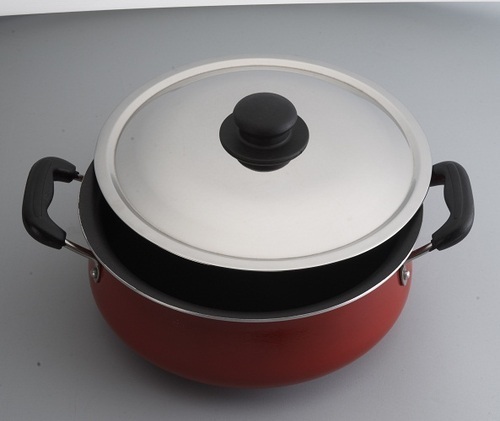 This range of Nonstick Cooking Pot is developed at well equipped production unit by making use of sophisticated machines and high grade quality raw materials. Products offered by us is highly demanded in various different places due to their unique designing and nominal prices. Owing to our genuine efforts of manufacturing, supplying, wholesaling and exporting a comprehensive gamut of nonstick aluminium cookware, aluminium non-stick cookware etc. We have been able to achieve the trust of various quality demanding clients across the globe. Aluminium is Economical & durable and has been chosen by us as an effective raw material for our range of cookware. Also, being highly conductive to heat and easy to clean, various clients have favored using aluminium cookware over others available in the market. This is the reason our range is selling well across the global market.